The Israeli Kfir (kfir is Hebrew for lion cub) is developed for ground attack missions. IAI combined the delta wing Mirage III/5 airframe with the J79 afterburning turbojet. 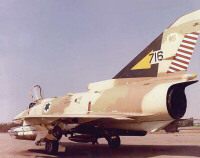 Compared to the French Mirage III and Mirage 5 it has a more powerful engine, bigger engine air intakes, a longer nose, revised cockpit, Israeli avionics and systems and a fin air inlet located at the lower front end of the fin. The first production versions were designated Kfir-C1. 25 upgraded C1s were leased to the US Navy and US Marine Corps to act as aggressor in advanced air combat training. The C1s were modified adding narrow-span canard foreplanes above each air intake and a small rectangular strake either side of the nose behind the ranging radar. These additions greatly improved its combat manoeuvrability and slow speed handling. These modified C1s were renamed F-21A Lion under the US Tri-Service system. Because of the low operating cost and good manoeuvrability the aircraft proved itself well in its new role. Kfir-C2 was the designation for the next variant, consisting of a dog-toothed outer wing panels, small under-nose strakes, and larger swept delta canards. These aerodynamic changes improved turn and take-off performance and improved handling at all speeds according to IAI. New avionics were introduced, including a new ranging radar, twin-computer flight control system, multi-mode navigation and weapons delivery system, central air data computer and HUD. The C2 variant was the production standard. Two-seat Kfir-TC2 trainers feature a lengthened and lowered nose for improved view. The longer nose houses the avionics displaced from the C2's spine and is fitted with small vortex-generating strokes. Kfir-C2/TC2 aircraft were upgraded to C7/TC7 standard. The C7 has a specially adapted version of the J79-GEJ1E with some 1,000 lb (454 kg) more afterburning thrust. The type has two extra hardpoints below the intake ducts and a number of advanced features including capability for the carriage and use of smart weapons, Elta EL/M-2021B pulse-Doppler radar, a revised cockpit with more sophisticated electronics and HOTAS (Hands On Throttle And Stick) controls and provision for in-flight refuelling. Maximum take-off weight is increased by 3,395 lb (1,540 kg), but combat radius and thrust-to-weight ratio are improved to a marked degree. The principal Electronic Countermeasures (ECM) system is the Elta EL/L-8202 advanced self-protection jammer. The latest upgrade is the Kfir-C10 standard, the upgrade is developed for export. It features a new Elta EL/M-2032 multi-mode radar, capability to use a HMD (Helmet Mounted Display) and Python IV air-to-air missiles and two 127x177mm Multi-Function Displays produced by Astronautics. Brazil looked at leasing 12 Kfir-C10s to replace the Mirage IIIEBR until the arrival of the F-X program aircraft, however no deal materialized. Colombia and Argentina have shown interest in the Kfir-C10. Colombia is looking to augment its small fleet of upgraded Kfirs. Argentina seeks a replacement for its ageing Mirage III/5 fleet, and is also considering former-Spanish Mirage F1Ms.